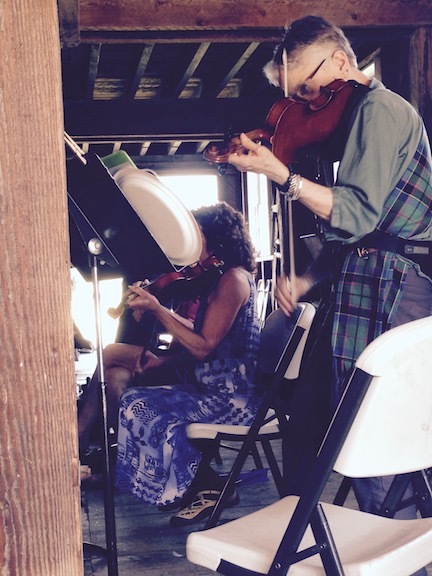 Dr. Joan Stevenson getting ready to perform at an Irish Festival. June 6, 2015. Joan certainly touched the lives of countless students, faculty and staff. Everyone knew her at WWU and were familiar with the countless works she produced (WWU Wrote a beautiful piece). But from the perspective of a new faculty member, Joan was the type of colleague you we incredibly thankful to have at your side. I first met Joan when I was interviewing at Western. After I gave my teaching talk Joan came up to me and said “brilliant! We need you at Western!” with a huge smile on her face. Her comments put me at ease for the rest of my interview and at that moment I knew WWU Anthropology was a welcoming department. As the quarters progressed, I came to know Joan personally over tuna casserole dinners at her home and regular office chats. Joan would barge into my office, sometimes to give me a knick-knack (see keychain at left… I think everyone in the department has a few of these), sometimes to throw some chocolate at me (literally…. she would frisbee toss a Reese’s Pieces on my desk from the doorway and mumble “keep working”), and sometimes to let me know what was on her mind after Faculty Senate. I came to appreciate her barge-in style and put a couch in my office so that she could sit more comfortably while sharing her seemingly endless knowledge about the four fields of anthropology. 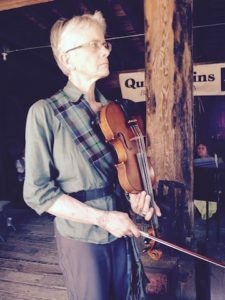 Dr. Joan Stevenson performing at an Irish Festival. June 6, 2015. As an informal mentor of my teaching and research, Joan was incredibly supportive. She would, as a colleague recently put it, “lift everyone up”. My first year at WWU I helped her rewrite and repackage a manuscript and she added me to the list of authors. When I asked her about teaching material she would almost immediately flood my email inbox with articles, and if she saw me on my way to class she would yell, “go wow them!” If anyone chiseled away at imposter syndrome, it was Joan with her never-ending encouragement. One thing about Joan, perhaps above all else, would always make me chuckle: Joan could jam on the violin. When she exchanged her crutches for a bow you knew you were in for a treat. Hearing her practice through the walls made me smile because I knew she would soon barge-in with another brilliant idea. Thanks Joan for lifting me up and for helping to make Western home. You continue to inspire me, are a role model for all of us, and are a friend that will be missed. Keep on jamming. ← Poster at AAA? Why not!